The Walking Dead: Season 9, Episode 12 'Guardians' Review – AiPT! Last week, Lydia was given back over by Daryl to Alpha and the Whisperers to avoid a potential conflict. This week, we dive into the fallout from that decision along with the continuation of a few critical subplots. Let’s dive into those first before we get to the really good stuff. Back in Alexandria, a council meeting of main characters has convened. Michonne is none too pleased to find out that Eugene and a few others have been messing around with a ham radio (which is what ultimately led to Jesus getting killed). Gabrielle tries to justify it by saying that Michonne is overstepping her authority in the name of security–and becomes even angrier when he finds out that Michonne spoke on Alexandria’s behalf to participate in the big tri-town fair coming up. Michonne isn’t having any of this bleeding heart “What’s life worth living if our friends fall?” nonsense. As far as she’s concerned, Alexandria surviving is the only thing that matters, even if it means isolating themselves from their fellow survivors. Her resolve is bolstered by Aaron, who agrees that her leadership is their best chance to stay safe and alive–and that a tri-town fair is a massive security risk. After the meeting, Gabrielle heads home to Rosita, who you may have forgotten is his girlfriend (although she’s pregnant with Siddiq’s child). After a brief discussion about Michonne’s abrasive leadership style, she leaves to go home…which was kind of surprising. I figured they’d be living together. Anyway, that bit of weirdness is nothing compared to what happens next between Eugene and Gabrielle. Eugene presents him with a psychotically detailed chart adorned with numerical values assigned to the pros and cons of Gabrielle as a boyfriend/husband for Rosita. It was as comically cringe-worthy as you’d expect. What was not expected was when Eugene decided to actually speak like a human being and hit Gabrielle with some stone cold truth about him being a total idiot for not fully committing himself to Rosita. I assume the slow motion shot of Gabrielle bringing a bag to Rosita’s house and going inside with her and Siddiq we see later means he that took Eugene’s advice…or that things are about to get very gross and freaky. Whatever the case, we also see a slow motion shot of Eugene nodding and smiling, so he must be cool with it…or he also thinks things are going to get weird and freaky. Hope you hadn’t forgotten about Negan, who voluntarily returned to his cell in Alexandria after not being able to hack it alone in the world. When Michonne comes to ask “What the hell is wrong with you?” Negan actually has the stones to ask if he can help advise Michonne in leading Alexandria. To his credit, he does make some good points, particularly about how she’s the one who’s truly in charge no matter what constitutional powers are written on a piece of paper. As you might expect, though, Michonne has no desire to hear any of his nonsense. Later, Judith admits to Michonne that she has been talking to Negan, primarily because she feels sorry for him and because he actually listens to her. Michonne counters that Negan is a monster and that people don’t change. When Judith points out that Michonne has changed, she does what all parents do when their kids beat them in an argument and sends her to her room. It’s somewhat frustrating we still haven’t seen what happened with Michonne during the time jump, but if even Judith is aware of it (or at least the change it caused in her adopted mother’s personality), then it’s gotta be something big. Whatever the case, this somehow inspires Michonne to go to Aaron and tell him that if the people want to send a delegation to the fair against her better instincts, she’ll be okay with it. The main narrative opens with Alpha and Lydia on a lovely mother daughter walk through the woods surrounded by the other Whisperers. Unfortunately for poor Lydia, she’s the only one without a walker skin to wear, which must have felt all types of awkward for her. Later, we see Alpha stomping around and glowering at everyone so we know she’s a brutal leader. Before things can get even more silent and menacing, Beta catches Henry lurking around camp and brings him before Alpha. Surprisingly, Alpha decides to hear him out instead of killing him right there on spot (which is what I was rooting for). Henry declares to her that he came for Lydia. Lydia responds by calling Henry stupid and punching him in the face, instantly making her my new favorite character. Alpha responds by telling the rest of her followers that despite Henry’s insistence that he came alone, she’s sure there must be more Hilltoppers out there. They bring Henry to Camp Whisperer, which is filled with way more non-walker skin-wearing people than I think any of us were expecting. While Alpha gives Henry the most horrifying Mom-to-Daughter’s Boyfriend talk in history, a brave Whisperer couple decide that they don’t think it was very cool they went back for Alpha’s daughter when they’re not supposed to go back for anyone and challenge her leadership. Alpha responds by decapitating the female dissident, holding up her head to everyone, and giving it over to her boyfriend. As he begins to weep, Alpha tells him that crying is weak (which is the type of thing that perpetuates toxic masculinity) before stabbing him to death (which is the type of thing that perpetuates fear and obedience in a cult). Later, Alpha tells Beta a story about when Lydia was little and almost died playing with a piece of plastic or something. She responded to this life-or-death crisis by first almost letting it happen, then smacking the hell out of her so that she would never do it again, thus proving that she was a terrible mother long before the dead rose and began roaming the earth. This also leads to her deciding that she needs to know if Lydia is truly on her side. That night, Beta and Alpha throw Henry down in front of her along with a blade, forcing her to chose between committing murder or having Beta kill her and her terrible boyfriend. It’s a great moment that actually made me fear for Henry’s life. Unfortunately, a group of ninja zombies picked this exact moment to attack the camp. The Whisperers who don’t get devoured put on their skins and beat a hasty retreat. In the middle of the chaos, Henry is grabbed by a person wearing a walker skin who turns out to be Daryl (!). He and Connie had managed to track him down at precisely the right time. Henry is grateful, but refuses to leave unless they take Lydia with them. Daryl and begrudgingly agrees. Much as I hated the ridiculous convenience of the events in the episode’s climax, I loved how menacing Alpha was. She truly is a uniquely horrifying villain compared to the ones we’ve had before. As far as the stuff with Gabrielle, Eugene, and Siddiq, I couldn’t honestly care less at this point. 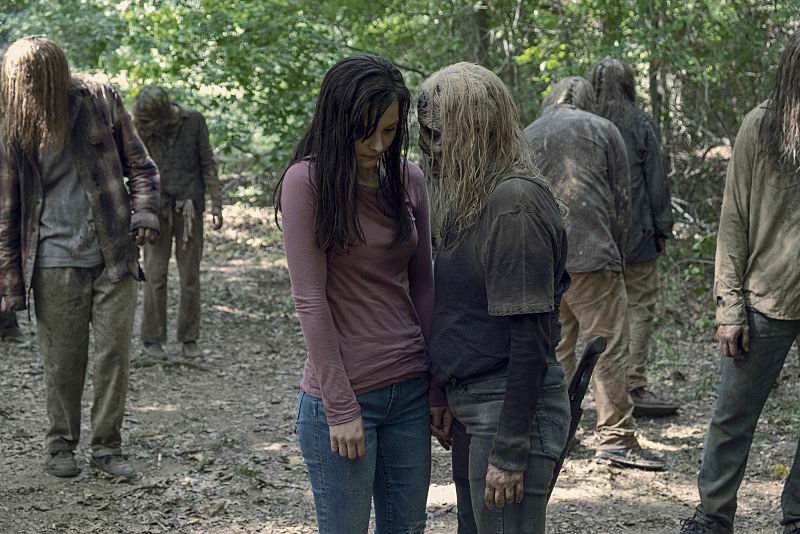 Maybe I’m just being too cold hearted, but Gabrielle’s love life and Eugene’s aspergers feel painfully minor compared to the threat of the Whisperers. Siddiq and Rosita’s baby is somewhat intriguing, but only because of the conflict the child could cause between everyone involved in its life. I’m still not sure what to think of Negan’s story right now, although if things follow how they do in the comics, then Michonne is going to end up calling on him for help sooner or later. Right now, however, I just really want to see what the heck happened during the time jump that has everyone treating her like Ted Cruz at a social gathering for senate members. All that being said, the true star of this episode was Alpha. She and her Whisperers have the potential to be the best villains this show has ever had–or at least the most horrifying. Meandering subplots and a contrived climax are not enough to derail the horrifying awesomeness of Alpha as the show's new villain. Alpha truly establishes herself as a force to be reckoned with beyond anything we've seen thus far. Michonne finally seems to reflect up how she's changed since the time jump and takes a step back. But seriously...when we are we going to learn about the really bad stuff that happened during the time jump? Does anyone care about the weird love square (?) between Gabrielle, Siddiq, Eugene, and Rosita?